Staying up all night with a throbbing neck is no one’s idea of fun. In fact, poor posture while you sleep caused by bad pillows can actually cause or contribute to neck pain! A special pillow can correct all of that and give you a peaceful night’s sleep. I have gone on a journey to test and review orthopedic neck pillows. Here are the five best ones to consider. You can kiss your neck pain and sleep woes good-bye with one of these pillows. Overview: Made by a trusted brand, this pillow is made of cool shredded memory foam to conform to your neck and support your cervical spine. It is sure to never go flat. You can adjust the shape and loft to your liking. Review: This pillow has a normal appearance but I could feel that it was different. The material was unrelenting the first night, but soon it caved to fit my neck perfectly. I had trouble sleeping on it at first but once it conformed to my neck, I slept like a baby and never woke up with neck pain! Overview: With a unique shape designed just for cervical spine support, this 100% cotton will mold to your neck and elevate your head. Even better, it is fully adjustable. It is proven to alleviate pain and snoring. Review: When I unpacked this pillow, I had a sense that it was quality because of its ergonomic design. The company even sent me a free custom pillowcase to fit it. I had to use trial and error to adjust it to my preference, but once I found it, this pillow was like a gentle cradle to my neck. It was soft and conforming. I did notice that the stuffing tends to shift, so I had to redo the pillow nearly every night. For this reason, this pillow did not make editor’s choice, but it almost did! 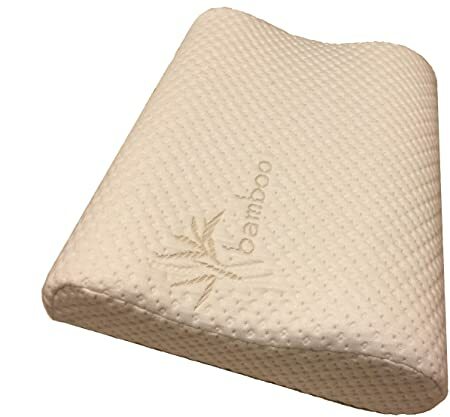 Overview: Using a chiropractor-recommended design, this eco-friendly special density foam with a cuddly bamboo cover is meant to ease neck and shoulder pain in users for good. This pillow has a medium loft and is great for any sleeping style. Review: This pillow also has a unique design that assured me it would help the crick in my neck. However, I found it to be too thin for my needs. I need a thicker, softer pillow. It is firm and will hold your neck in place. 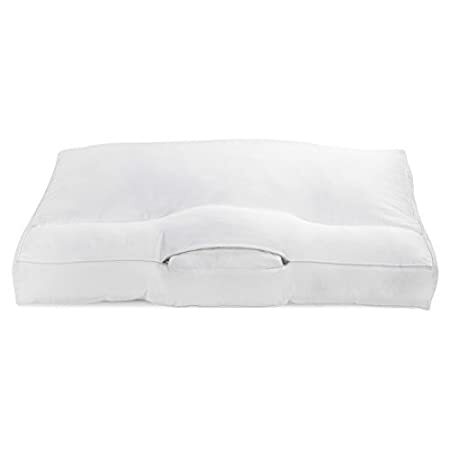 The washable cover is extremely soft, almost making up for the pillow’s firmness. 4. 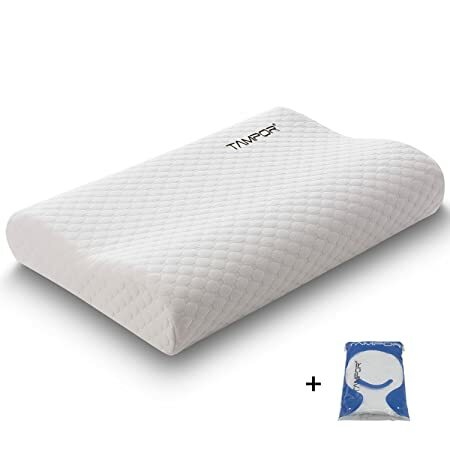 Tampor Memory Foam Contour Pillow – Editor’s Choice! 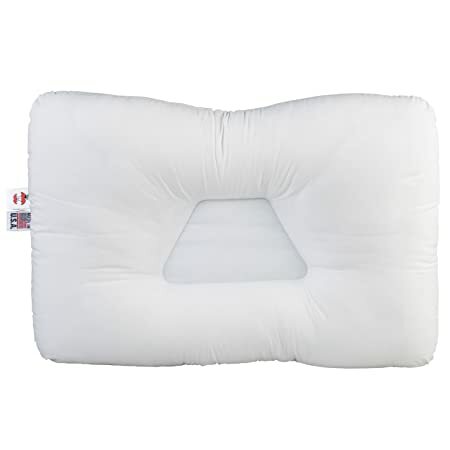 Overview: Certipur memory foam comprises this contoured pillow, with a special orthopedic design for neck pain. The memory foam is treated to not become stiff in cold or hot in heat. It is designed to naturally support the cervical spine and open the airway, allowing for smooth breathing and relief from snoring. Review: For once, a neck pillow that let me sleep like a baby! After trying many pillows, this one impressed me the most. I found no real cons. I just know that it allowed me to sleep easily and I woke up with no neck pain. It relieved snoring in my husband, as well. The gentle curve is perfect for neck support and allows you to sleep easily. There is no adjustment period to using this pillow. There is some odor when you unpack it which goes away in about two weeks and the pillow itself must be spot cleaned but the cover is washable. Overview: The design of this pillow is meant to straighten the spine, improving posture and pain. It has tall side lobes to support the neck and force you to sleep on your back, the best posture according to scientists. The fiber is made to spring back so the pillow never goes flat or forms a dip where your head usually sits. 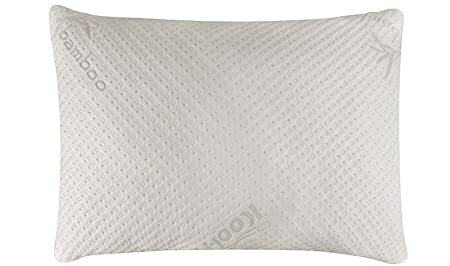 Review: Since I am a chronic side sleeper, it took a few nights to adjust and fall asleep on this pillow. It works very well and offers great neck support. My neck pain has disappeared using it. However, it is starting to flatten after a few months because it is made of cotton fiberfill, not memory foam. On the plus side, there is no odor when you unpack it and it is washable. Neck pain can keep you awake at night. It can also be caused by poor sleeping posture. Correct your posture and improve your pain with an orthopedic neck pillow. Hop on Amazon and start looking for your best orthopedic neck pillow right now. You owe it to yourself.